Your employees deserve recognition for the work they do to keep business moving forward every day. Whether the business itself is just starting off or it’s been around for decades, employee anniversaries should get some attention. You could have a celebration in the breakroom with cake and drinks, and you might consider framing an important picture or certificate. Personalized gifts in Santa Clara and San Jose remind your employees that you notice them . Read on for some more ideas for honoring employee anniversaries. It’s not every day that you reach an important milestone in your career, and it’s nice to know that everyone else appreciates your hard work. The longer an employee is with a given company, the more he or she does to shape the brand’s identity by working conscientiously and consistently. Every five years is a clear benchmark, and each one is significantly more impressive than the last, so don’t forget to celebrate when someone hits 20 years in the business. 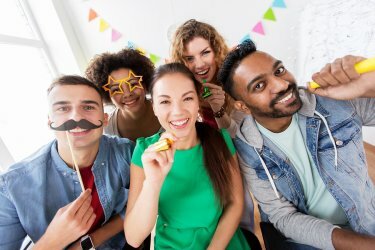 If you run a small business that’s just starting off, small yearly anniversary celebrations can help boost morale and assure your employees that you notice their feats. Simply bringing cupcakes to the office can be enough recognition to make your employees happy. An employee that works with the same company for years and years will probably rack up a few accomplishments over that time. Take some time out of the day to make note of what the employee has done for the company on the day you celebrate his or her anniversary. This teaches the rest of the team about work that this person may have done behind the scenes, that their colleagues might not have known about. Make the anniversary more special by discussing what it means to the company. Everybody likes getting presents, and some people have never been given a personalized gift before. Trophy engraving and custom frames are more thoughtful than standard gifts that are given out to everyone on their work anniversaries, so get creative.